This article is about the raid battle. For the non-party character, see Lucilius. Participants: 30 Vice: 2nd-3rd Elixirs: Unlimited Strike Time: NoStrike Time does not apply for this raid. Massive random element damage to one allyVerification needed. .
Multi-hit, random element damage to one ally with highest HP. Moves to next ally with highest HP if the target dies. 9,999,999 random element damage to all allies. 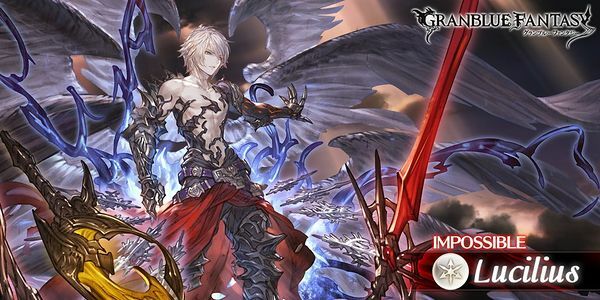 Only Lucilius must be defeated to clear the battle. If Lucilius and Black Feather are at full diamonds below 50%Verification needed. Cannot be removed. on one ally. Dark damage to all allies and removes buffs on all allies. Shares mode bar with Lucilius. Drop table last updated: 2019-04-11, all stated drop rates are estimates. 30,000 Plain damage to all allies. Random element damage to all allies. and DMG Cuts less than 100% total work normally. will not trigger, cannot be revived). Removes all debuffs on Lucilius. 999,999 random element damage to all allies. Massive random element damage to one ally and remove all buffs. 3-hit random element damage to random allies. Removes multiple debuffs on Lucilius. Local status effect by 1 additional lvl. Extends buff skillYellow-bordered skills cooldowns by 2 turns. It is NOT Time Warp. It is a different status. Knocks out all allies for all members of the raid. Normal attacks hit all allies and deal random element damage. Casts The End for all parties. Casts Paradise Lost (Join Trigger). Normal attacks change to multi-hit random element damage. Fills charge diamonds to max. Charge diamonds are not reset. Casts Paradise Lost (10% Trigger). Raises by 1 lvl for every special attack Lucilius casts. Lowers by 1 lvl upon taking a buff-removing effect. Lucilius recovers HP every turn. Damage to Lucilius is capped depending on number of unique Main Character classes in the raid. Each duplicate class reduces cap by 50,000. Local status effect if the wings are above 50%. 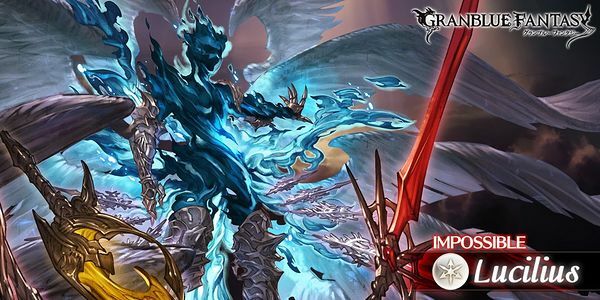 Removes all debuffs on both Lucilius and Black Wings. Can only be triggered by one party. Only damage and effects dealt to Lucilius qualifies to complete Labors. Drop table last updated: 2019-04-13, all stated drop rates are estimates.